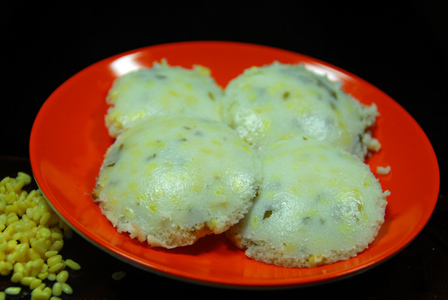 Steamed idli is crumbled and briefly cooked in oil along with onion and dalia powder. 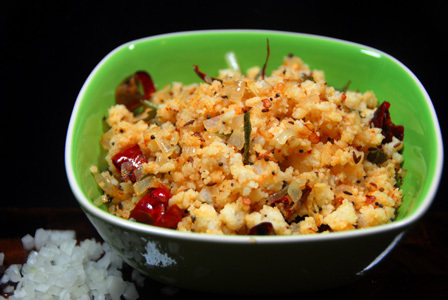 Serve idly onion upma with a glass of buttermilk if desired. Click here for recipe of dalia powder. Makes: around 2 Servings of Idli Onion Upma. Crumble the idly into very small pieces and keep aside. When mustard seeds start spluttering, add chopped onion. Fry briefly, add the crumbled idly and salt. Let it cook for few seconds on low flame and stir in dalia powder. Serve idly onion upma immediately with a glass of buttermilk if desired. Notes: Make sure not to overcook once the idli is added. Suggestions: Adjust dalia powder according to your preference. Variations: You can also add roasted peanuts in the end if you desire. Other Names: Idli Onion Upma. Idly batter is steamed in a wide vessel layered with powdered dalia. The steamed idly is then finished with chopped garlic and spices. Serve idli with dalia powder with any chutney of your choice. Makes: around 2 Servings of Idly with Daliya Powder. Peel and roughly chop garlilc cloves. In a mixing bowl, mix together idly batter, salt (if required) and water (if necessary) to make into little thinner consistency. Grease a wide vessel with ghee and pour the above batter into the vessel. Sprinkle a thick layer of the dalia powder on to the idly batter. Heat a pressure cooker with few cups of water. Carefully place the vessel and without a whistle pressure cook for around 15 minutes or until idli is soft and toothpick comes out clean when pierced into the idly. Once done, cool the idli to room temperature and cut into big chunks. When mustard seeds start spluttering, add garlic cloves and stir in the idli chunks. Fry briefly for a minute or two and remove from heat. Serve idli with dalia powder with any chutney of your choice. Notes: Make sure idli is cooked well. Suggestions: Adjust spice with red chiles. If idly comes out thick, next time thin out the batter with little water. Variations: Check other spicy steamed idly here. Other Names: Idly with Daliya Powder. 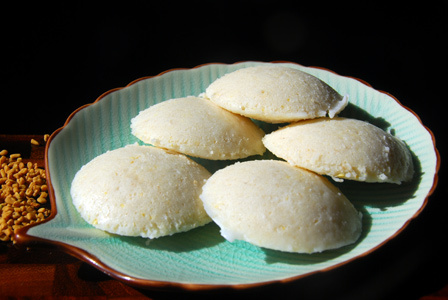 Idli batter is prepared with idli rawa and urad dal. Choice of raw vegetables are finely chopped and cooked in oil and added to the Idli batter. Fried vegetable dlis are steamed till soft and fluffy and can be served with any chutney of your choice. Makes: around 8 Fried Vegetable Idli. Wash the bell pepper, tomato and cilantro. Finely chop the tomato, onion, bell peppers and cilantro. Soak urad dal in water for 3 – 4 hours. Soak idli rawa in water for around half an hour. Grind the urad dal into smooth paste and remove onto a mixing bowl. Squeeze out most of the water from the idli rawa and add the idli rawa to the urad dal paste. Mix thoroughly and add few tbsps of water if the mixture is too thick. Leave the batter aside and let the batter ferment for atleast 2 – 3 hours. Heat oil in a pan, add cumin seeds and fry for few seconds. Then add the chopped onion, green chiles, bell peppers, peas and tomato in to the pan. Cook for around 2 – 4 minutes until all the vegetables are cooked. Remove from heat and cool the mixture to room temperature. In a mixing bowl, mix together idli batter, cooked mixture and salt if necessary. Grease the idly moulds with little ghee. 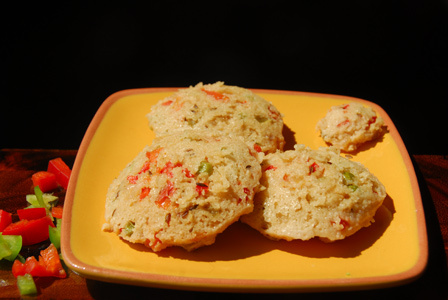 Pour around 3 – 4 tablespoons of the prepared vegetable idli batter into each mould. Steam the idly for 8 – 10 minutes and remove from heat. Let the idlis stand outside for couple of minutes before removing the idlis from idli moulds. Apply a drop of ghee to each idli to avoid drying before serving. 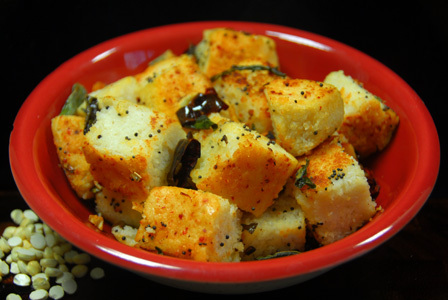 Serve fried vegetable idli with coconut chutney or any spicy chutney of your choice. Notes: Refrigerate any remaining batter for next time. Suggestions: If the idli is still wet inside, steam them for couple more minutes and let them stand for few minutes outside. Variations: Add your choice of vegetables to the oil if desired. Other Names: Fried Vegetable Idli.